So our story began a while back. We’ve talked of getting bikes so that we could start riding. By a while, I think we’ve talked about it for 3 or 4 years? My brother is “in the industry” or used to be, so I had visions of getting deep discounts on something really cool. Before we get into the selection, a little background on me. As a kid I was always on a bike, but only a bmx style bike, never a road bike, never a “10-speed” as we called them back then, never a mountain bike. Though I did pick up a mountain bike for $25 in high school, I honestly think I rode it home, and then likely never again. I never rode for competition, it was always for fun. Last spring I drove down to Southern California (from the San Francisco Bay Area) and picked up two things from my brother. One a Suzuki SV-650, and the other being a 2004 Diamondback XTS Moto (pictured). I rode it last summer before we had our baby, I put about 111 miles on it from June through September, 98% of that being on flat bike/walking trails in Belmont and San Carlos, CA. The bike was overkill for that, and the only time I tried riding it up a hill near our old house I couldn’t keep the front end on the ground, a full suspension bike is definitely not what I need. So, we had the baby in October, we moved to Half Moon Bay in May and we decided it was time to get ourselves some bikes to ride. I actually decided to buy my wife a bike before myself, for her Mother’s day gift. I tried to go to REI and get her one the night before the holiday but they pretty much shut me down. They said I could buy one, but I shouldn’t, I should bring her in and get her fitted for a bike. So on mother’s day we headed over to REI to let her get fitted. More on what she got later. 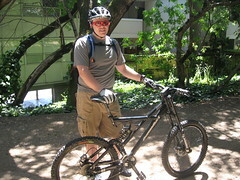 While looking at bikes there for Mother’s Day the staff at REI basically asked, what kind of riding do you want to do? Well, all kinds? So the question becomes, what kind of bike should we get. Basically since we were starting out riding, we wanted something that we could ride on paved trails, as well as unpaved trails. More so on the paved then unpaved. That being said, they suggested a hybrid setup for us. A hybrid bike is a bike that looks and seems like a road bike, but isn’t quite a road bike. They tend to have a similar geometry to a road bike, but a front fork (suspension) and not quite road tires. This allows for a road like feel, but also the comfort/ability to go off the beaten path without fearing for your life (though I can only assume the fear part as I’ve never been on a road bike, much less one in dirt). For Natalie we ended up getting a Cannondale Quick CX 3. It has turned out to be a great bike for her so far, putting just about 50 miles on it. It’s white/black and red, and has a front fork that can be locked into a solid configuration. Having a front fork that can go into a locked out position is very handy when riding on pavement. Though the Quick CX 3 isn’t the easiest thing to lockout while riding, it can be done. For myself, I liked the Quick CX lineup, like Natalie’s, but I decided I wanted to one up her! So I went and got the Cannondale Quick CX 1. What's the difference between the CX 1 and the CX 3? To be honest, not too much, and probably not enough to justify the cost, but hey, I enjoy my bike. The two biggest differences are 1) the CX 1 is a bare bike, no paint, just a clear coat over the metal. 2) instead of a dual shock setup on the front fork, the CX 1 has a single headshok. This actually makes it VERY easy to lockout while riding, and I frequently find myself locking and unlocking the suspension based on the surface. I’ve put 90+ miles on my Quick CX 1 in the past month, since I got it, and I must admit I think it is a great bike. I’ve done quite a bit of road riding, and some double and single track riding. It has performed great for all of it. I need to get the bike in to REI so they can do the free tune-up that comes with bike purchases. They recommend you ride it for a while, I think around 100 miles, then bring it in to get things tightened up. One of my goals for biking though is to ride enough to justify getting a road bike. 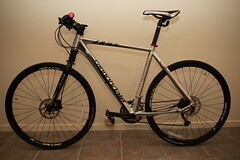 I may end up selling that Diamondback XTS, if I do, I’ll use that money to get a road bike. I’ll definitely keep the hybrid though as well, I love having the ability to ride some of the trails here in Half Moon Bay. I also plan to use it when we start putting our daughter in the trailer and take her for rides, but that is a whole other blog post (or series of) down the road. So what is the tip for today’s post? Tip: What size bicycle is right for you? Unfortunately I don’t know enough yet to tell you the answer to that question. Hopefully over time I will be able to tell you more, but for now, here’s what I can tell you. I’m 6’4” tall, and wear 34” inseam pants, I got an XL for myself. I would recommend if you are looking to get into riding that you go to your local bike shop (LBS) and get fitted for something. I found that REI was very helpful, I didn’t hit a local small shop, but I will definitely check some out here as I look to expand my stable. Before buying the bikes at REI, I really wanted to get my brother to get me a bike, on a sweet deal. At first I was a little hesitant, no offense to REI, but they don’t tend to have the cheapest prices around. I purchased Natalie’s bike for $699 (I think that was the price) and started to regret that a week later when their annual member’s sale took effect and ALL bikes were 15% off. I went back to REI with the receipt in hand, and they, no questions asked, refunded the difference. That right there sold me on REI. I had no doubts about going to buy my bike from REI after that, and I got mine on sale as well.